1. Liver. 2. Stomach. 3. Pancreas. 4. Duodenum. 5. Mesentery. 6. Peritoneum. 7. Small intestine. 8. Fat. The peritoneum is a serous membrane that lines the peritoneal cavity and covers the surface of the viscera within it. Like the other serous membranes of the body, the peritoneum has a parietal layer, which covers the wall of the abdomen, and a visceral layer, which covers the individual parts of the intestine. A small amount of fluid lies between these two layers in an extensive potential space, allowing free movement of the organs over each other. Although the peritoneum is formed in much the same way as the pericardium, the intestines are so much more complicated in shape than the heart that there are very many folds and layers of the visceral peritoneum. The greater omentum, a fold in the peritoneum containing layers of fat cells, forms an apron over the intestines. One particularly important part of the visceral peritoneum is a fold which is attached to the rear wall of the abdomen. 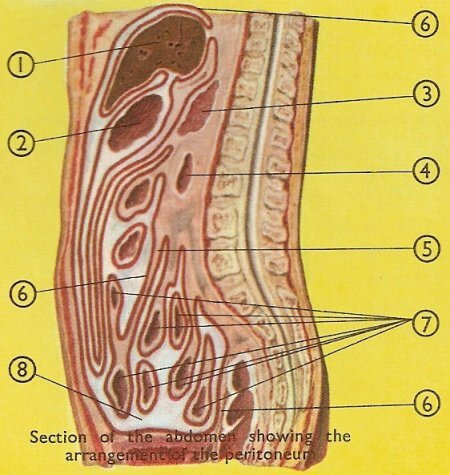 This part is called the mesentery, and between the two layers of this fold lie the coils of the small intestine. Inflammation of the peritoneum is called peritonitis. The parietal and visceral peritoneum are parts of one continuous membrane which may be regarded as being originally a simple closed sac that lines the walls of a closed cavity. During development, as in the case of the pleura and the lung, the abdominal viscera have been invaginated into the sac as the fist might be pushed into a collapsible rubber-ball. As the developing cavity and sac increase in size, a viscus may be pushed so far into the invaginated sac that it loses contact with the wall of the cavity. The parts of the "visceral" layer that cover the sides of the viscus then come together behind it and form a "fold" that stretches from the viscus to the wall. A fold of peritoneum therefore does not have the usual meaning of the word "fold". It is a double sheet of peritoneum connected with a viscus. At its visceral margin, its two layers separate to become continuous with the peritoneum on the surfaces of the viscus; at the parietal margin, they separate to become continuous with the parietal peritoneum on each side of the fold. Between the layers, vessels and nerves pass to the viscus.